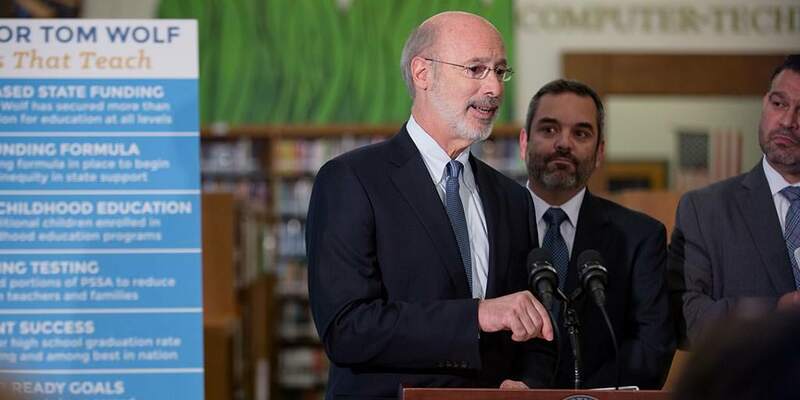 Harrisburg, PA – Governor Tom Wolf joined parents, teachers and school administrators today to announce more improvements to standardized testing in Pennsylvania. After reducing the number of test days by two days this school year, starting next school year, the Pennsylvania System of School Assessment (PSSA) will be condensed from three weeks to two weeks and shifted to later in the school year, easing stress on students and giving them up to two additional weeks to learn before taking the assessment. The new schedule builds on changes taking effect this school year to remove two sections of the PSSA – one in math and one in English language arts – and reduce questions in the science assessment, which is enabling the Department of Education to condense and move the testing window to later in the year. This year, the PSSA exams will take place during a three-week testing window which will begin April 9, 2018. Removing two sections of the assessment reduced the amount of classroom time by an average of two days in most schools, enabling the Department to shorten the test window to two weeks and provide school districts the flexibility to begin the assessment as late as April 25 in future years. Since school districts have already established their school calendar the new testing window will begin with the 2018-19 school year. The Department identified the PSSA changes during discussions with stakeholders for nearly two years when developing the Every Student Succeeds Act (ESSA) Consolidated State Plan. The plan is a federal requirement to replace the No Child Left Behind Act. The Department of Education worked with experts and stakeholders to improve the PSSA and ensure the exams maintain rigor. Since standardized tests can interrupt learning and can be disruptive for students, even those in non-tested grades, the Department will continue to identify ways to further reduce those disruptions in coming years. Improving standardized testing has been a priority for Governor Wolf. The requirement that students pass an end-of-course tests known as the Keystone Exams has been delayed, and career and technology education students can now demonstrate proficiency and readiness for high school graduation in an alternative pathway, when necessary. Provided historic funding for education to reverse devastating cuts of the past with $800 million for educational programs and to bring teachers back to the classroom. Increased graduation rates to among the highest in the nation for four-year cohorts from 85.5 percent in 2013-14 to 86.1 percent in 2015-16. Become a leader in STEM education with five nationally-recognized STEM ecosystems and 31 percent more students earning industry-recognized credentials as well as ranking fourth in the number of STEM graduates and in the top 10 of states for STEM jobs. Additionally, the department’s proposed Future Ready PA Index will serve as Pennsylvania’s one-stop location for comprehensive information about school success, and will use a dashboard model to highlight how schools are performing and making progress on multiple indicators. Once implemented, the Future Ready PA Index and ESSA Consolidated State Plan will focus on the individual student to create diverse measures of school success, invest in great teachers, and expand college and career readiness pathways for STEM innovation and capacity.